It's Thursday, and Nintendo has updated its various digital delivery services with fresh new games, some that come close to being more exciting than the appearance of the 3D Glee concert musical trailer that hits Nintendo Video today! I know what you're thinking. What could possibly be more exciting than a 3D Glee trailer? Nothing. That's why I said almost. You guys really need to start reading more carefully. So what comes close? 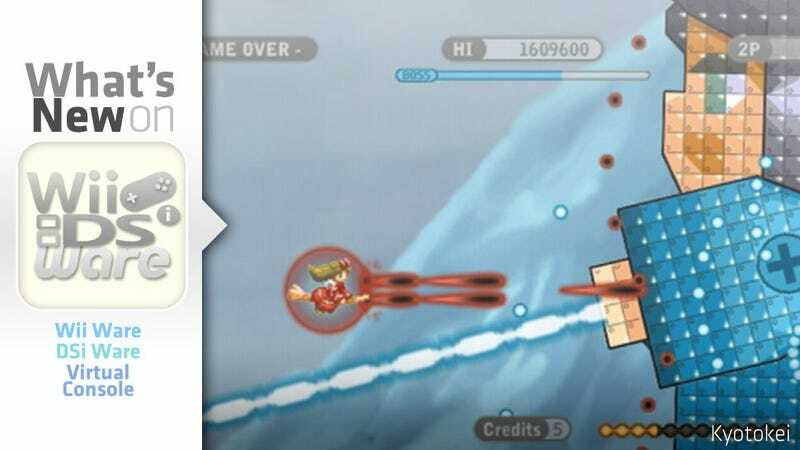 Microforum's WiiWare shooter Kyotokei is right up there, with colorful graphics, unique enemies, and two-player co-op action. Crazy Hamster for DSiWare inches close as well, if only because it's called Crazy Hamster. My Asian Farm lets you grow Asian people, unless I read the description wrong. That's pretty exciting. Oh wait, read that wrong. Nevermind. The powerful witch Rika has invaded the peaceful realm of Estaria with an army of monsters! The magic brothers Kyo and Kei are the only ones who can stop her! Use your powerful aura of protection to absorb the enemy spells and unleash their power all at once! Travel through the dark swamps, cold mountains, dangerous caves full of lava and much more! Face Rika and free Estaria from her menace! After a disastrous previous relationship, our chubby hero, Master Higgins, finally found true happiness with his new love, Tina. Things couldn't have been going any better for Master Higgins as he sailed across the beautiful tropical water with his beautiful tropical wife. But little did he know that trouble loomed just over the horizon. A vicious hurricane tore apart the raft that Higgins and Tina were on, and they soon found themselves tossed into the sea. They became separated and beached on different islands, and both had amnesia. Tina was taken in by the king of Waku-Waku Island, and soon she was betrothed to him. Then Master Higgins made his way to the island…and the adventure continues. There is no rest, even in the afterlife. A classic action game that introduced a unique system for possessing and controlling other characters is now available on the Nintendo eShop. While out on a walk with his girlfriend, our hero is gunned down by an evil syndicate that wants to harness ghost energy. This syndicate plans to ransom the poor girl, who is the daughter of a prestigious scientist, to force her father to cooperate. But our hero's adventure isn't over. In fact, it's just beginning. He's come back as a ghost so that he can rescue his girlfriend from her kidnappers and finally rest in peace. Get ready for a brand new experience in arcade action - the worlds first Chase ‘em up!!! Take control of Kokopolo, the hyperactive wildcat, in a crazy, fast and frantic, action-packed caper set across 80 stages of pure arcade mayhem. Hunt down those responsible for disturbing your afternoon slumber, with a quick slash from your sharp claws, and lure them into an epic chase, through mind-twisting mazes, and across hazard filled highways…finally leading them to their doom, in the bellies of the ever-hungry, carnivorous Snap Snap plants! But the fun doesn't end there, once the unsuspecting enemies have been devoured, focus shifts to the low screen, where perfect touch-timing must be utilised in order to digest the enemies once and for all. My Asian Farm is a breeding simulation game! At the beginning, all you own is an empty field, a few yuans and a single hen... You need to feed the hen, take care of it and improve its lifestyle. Well-fed with seed, your hen will lay eggs which can then be sold to the Shopkeeper. With this money, you can buy new animals at the Farmers' Market. Little by little as your farm builds up, you will unlock certain bonuses: a pagoda, a rickshaw, a guard dog, etc. And you will be able to exchange your animals with your friends who play My Farm, My Exotic Farm, My Asian Farm or My Australian Farm! The winter is coming. Crazy Hamster forgot to store his supplies. Now he has to visit different lands to get them before winter. Crazy Hamster is so crazy, that he sees nothing but the fruits. The lands he visits are full of traps and obstacles that he won't even notice. You have to help him and neutralize those traps. There's no time to lose! Crazy Hamster has already set off!